Risk for Achilles tendon problems are not isolated to pro athletes. You don’t have to be an accomplished athlete to suffer Achilles tendon injuries. They can happen from household tasks like climbing a ladder. Achilles tendon weakness is common in adults. But seeking treatment when symptoms occur can prevent more serious injury. Achilles tendonitis is common for anyone whose work routine puts constant stress on the feet and ankles. Achilles tendon injuries happen most often to less conditioned, ‘weekend warrior’ athletes who overdo it. But I’ve also had patients who have ruptured the tendon simply by climbing a ladder quickly. the major causes of Achilles tendon injuries involve jumping and running. People risk further deterioration and possible rupture when they don’t seek medical care for Achilles tendon injuries. 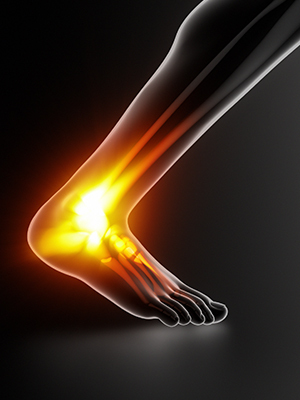 The main symptoms of Achilles tendonitis are pain, stiffness and tenderness. Pain occurs in the morning, improves with motion, but gets worse with increasing stress and activity. In activities like basketball and tennis, muscles and tendons in the back of the leg are prone to injury from an imbalance that occurs from a lot of forward motion. As a result, the frontal imbalance can weaken the tendon unless stretching exercises are performed regularly. The best way to prevent Achilles tendon injuries is to warm up gradually by walking and stretching. Avoid strenuous sprinting or hill running if you are not in shape for it. For further information about Achilles tendon pain, visit our Achilles Tendonitis page. Or contact AFAS today to schedule a foot and ankle consultation.